Robert knows little of his past and his present becomes an inescapable nightmare when a routine hospital procedure under anaesthetic leaves him awake but unable to communicate his pain and distress. Matters deteriorate further when he discovers that he is not human – a fact verified by the Special Agents in the operating theatre. To effect his escape Robert has to resort to behaviour he has never experienced before – violence, deceit, threats. 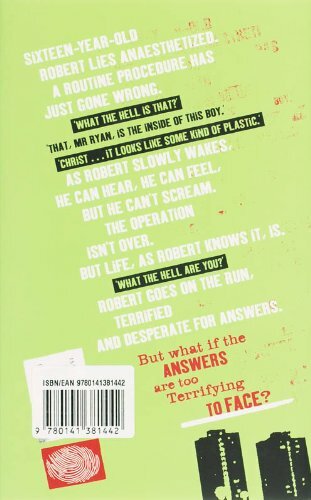 Through Robert’s dilemmas, Brooks presents the reader with questions about the nature of identity and personal security. Robert teams up with Eddi, whose stock in trade is the creation of new identities for criminals evading justice and together they flee to a new life in rural Spain. For a time their lives are idyllically ordinary but when their location is discovered and Eddi is killed by the Special Agents who have pursued them, Robert is emptied of ambition, emotion and direction. He leaves, disappearing into the darkness of the night and leading readers to engage in on-line debates and blogs on the issues raised by the book. This is a powerful study of identity in a world which is often confused and corrupt, though the tension of the opening chapters is not always successfully recreated later in the book.